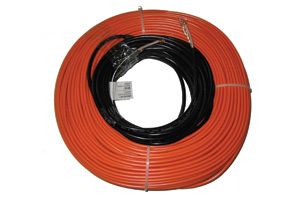 Underfloor Heating Inscreed Cables are used as an economical solution for new screed floor constructions. Ecoflex In-Screed Underfloor Heating Cables have a rating of 15W/Linear metre & are an economical solution for new screed floor constructions. The first step is to determine the number of W/m2 that you require for your installation. This could be provided by calculating the heat losses from the room you intend to heat. This figure will depend on the standard of insulation in the building. However the table below can be used as a rough guide. To calculate the cable spacing distance C-C (centre-centre) use either of the two formulas below: Where free floor space is the total useable floor space less 10% perimeter allowance. Before commencing, the entire sub-floor should be swept clean and be free from any sharp objects. If laying onto foil backed insulation ensure the area is dust free to enable a good fix. It is good practice to plan your installation using a sketch marking your laying pattern and planning the positions for the floor sensor, the connection box and thermostat. Attach the Eco-Fix band to the sub-floor or insulation using fixing nails or high impact adhesive tape. The Eco-Fix bands should be spread evenly accross the floor at intervals of 750mm. A 75mm border should be left around the perimeter of the room. Do not remove the cable from the drum before laying as it will twist and make the installation difficult. The heating cables (orange cables) must not touch each other and should never cross. The heating cable must not be cut or shortened and the joint between the cold tail and the heating cable must not be bent or put under strain. The floor sensor for the thermostat should be positioned between 2 heating cables approximately 500mm from the wall. The black flexible conduit provided should always be used to install the floor sensor probe. Once laid the heating cable should be covered with a minimum of 50mm sand and cement screed. Before and after covering the heating cable with the screed, the cable resistance should be checked against the label value. Avoid traffic over the areas until the cable is completely protected. The screed should be allowed to dry completely before turning on the system. Please check screed manufacturers instructions. A fully qualified electrician must now make the final connections to the mains supply and install the thermostat. The thermostat should be installed in the room to be heated. For bathrooms the thermostat will be a floor sensing only model and must be placed outside the room but as close to the installation as possible. Finally the electrician should check for continuity of the floor sensor and retest the resistance of the cable. A further insulation test should be carried out in accordance with IEE regulations. The installation should be protected by a 30mA RCD for safe operation.